Labrador retrievers are one of the most popular dog breeds all over the world. They are easily trainable, adore being with and around their family, and are full of energy. They are very outgoing yet gentle, even-tempered, and very trusting. The Lab is known as the original fisherman’s friend, being able to swim even in strong currents. They’ve evolved to be excellent hunting companions, thanks to their powerful jaws yet very soft bite. In a word, the Labrador is multi-talented, from being a companion pooch to a therapy dog and even a military dog. Because of these various roles, the Lab requires only the best nutrition it can get. This buyer’s guide is for those who are passionate enough to give only the best dog food for their Labs. 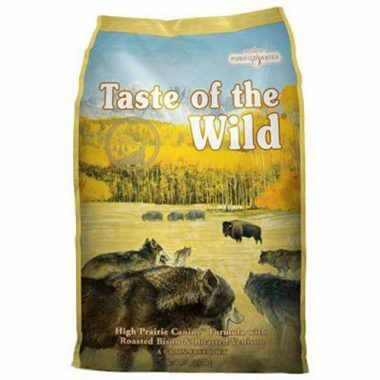 Taste of the Wild is one of the top rated dog food brands because of its excellent blend of high protein, moderate fat, moderate calories, and the addition of probiotic microorganisms designed to boost your Lab’s immune and digestive functioning. One of the most interesting features of the TOTW Canine Formula is their reliance on premium quality novel animal proteins that can help reduce, if not eliminate the risk of food allergies in Labs and other pooches. It consists of high quality meats from buffaloes, lambs, chicken, bison, deer, cattle, and even ocean fish. It does away with cereal grains and instead opted for wholesome grains and carbs like peas and sweet potatoes. Its calories are supplied mostly by fruits and vegetables as well as eggs. 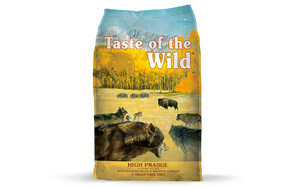 The Canine Formula is one of your best bets for the highest quality in Labrador dog food. 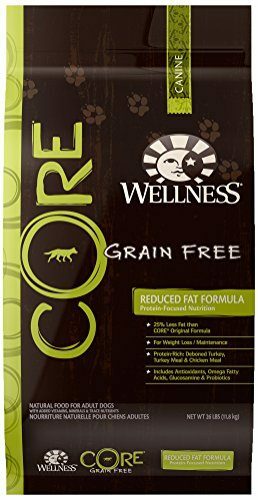 If you think your Lab is predisposed to canine obesity, especially if it isn’t getting enough exercise, then you may want to give it the Wellness CORE Reduced Fat Natural Grain Free Dry Dog Food. Unlike other dog chow formulations, the Wellness CORE Reduced Fat comes with a minimum of 10% fat while still providing enough calories for your Lab to perform many of its daily activities. 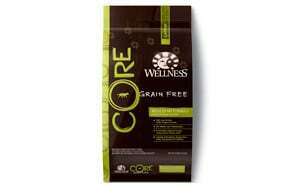 The Wellness CORE is one of the best dog food not only for Labs but also for other breeds precisely for its unique proportion of proteins and fats as well as moisture and fiber. In addition to its rich fiber content, the Wellness CORE also comes with nutrients that encourage the optimum development of your Lab’s joints as well as probiotic microorganisms for healthier digestive and immune systems. We would like to believe that it is less allergenic than other types of high quality dog food since it doesn’t include cereal grains in its formulation. However, it still incorporated chicken meal into the mixture which can be allergenic in itself. Nevertheless, this is a great option for those who wish to have their Labradors develop a leaner body. 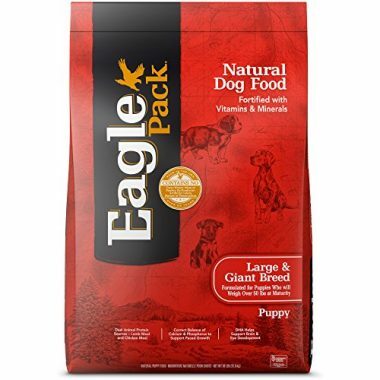 Eagle Pack’s Large and Giant Breed Puppy Dry Dog Food provides the right amounts of calories, proteins, and fats for the growing Lab. This best dry dog food for Labs comes with probiotic microorganisms sourced from 8 different gut-friendly bacteria and helping facilitate the healthier development of the Lab puppy’s immune system and digestive functioning. It also comes with DHA as well as EPA for added benefit to the growing central nervous system and the overall maturity of the immune system, respectively. In addition to the lactobacillus species, Eagle Pack also comes with select botanicals purposely to improve the overall nutritional profile of the puppy food. It is also formulated to be gentle on the young Labrador’s tummy as it contains non-allergenic white and brown rice, oatmeal, and barley as four of the first 5 ingredients. It’s got all the necessary vitamins and minerals for optimum Labrador puppy development and growth. 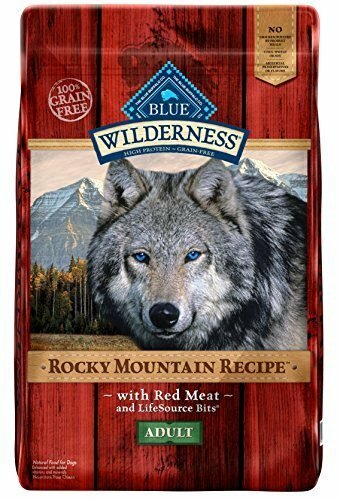 One of the best dog food for Labradors you can ever get is the Rocky Mountain Recipe High Protein Grain Free Adult Dry Dog Food formulated and manufactured by BLUE Wilderness with its now-iconic LifeSource Bits technology. This helps ensure that your Labrador gets the perfect blend of minerals and vitamins for optimum growth and maturation while ensuring the optimal functioning of all physiologic processes in its body. Unfortunately, while it does market itself as a grain free dog chow supposedly to minimize the incidence of food allergies, the inclusion of beef and chicken into its formulation somehow negates the idea of hypoallergenic food. Perhaps it has something to do more with the easy digestibility of animal proteins than plant-based proteins. Nevertheless, the addition of glucosamine should also help ensure healthier joints for your active Labrador. The inclusion of 5 strains of good bacteria into the blend also helps improve overall immune system functioning as well as promote digestive health. 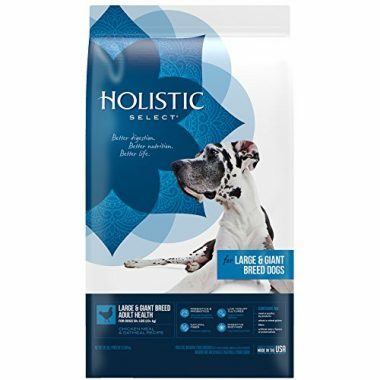 The Holistic Select makes its way into our list of the best dog food for Labradors for its unique formulation that focuses on supporting the Labs digestive functions and immunity through the inclusion of probiotics, prebiotics, digestive enzymes, natural fibers, and healthy botanicals in its formulation. While it doesn’t label itself as grain free meal, one can expect cereal grains to be excluded from the formulation since it places more emphasis on wholesome grains like oatmeal and brown and white rice. This is in addition to premium quality chicken meat providing the proteins necessary for your Lab’s optimum growth and development. Technically, if you’re concerned about your pooch developing allergies to chicken, you might want to consider Holistic Select’s anchovy, salmon, and sardine variant instead. Before we go into the details of how you can pick the right dog food for your Labrador it is important to gain basic understanding of the various characteristics of this breed of dog. This will lay down the foundation for the kind of diet and nutrition that is right for them. Labs have a sturdy built but not heavily muscled. It is best described as either medium or large sized and can weigh anywhere between 50 and 80 pounds. Its body is well-proportioned with its limbs proportional to its spine. The Lab has chiseled facial features and has well-defined muscles on its body. The Lab has a thick undercoat to go with a water-resistant top coat. Labradors are known as excellent runners, both as sprinters and as marathoners. As sprinters, they need tremendous energy for short bursts. As marathoners, they’ll need slower-burning energy sources that will last them many miles before tiring. Labs are also excellent jumpers, fully capable of clearing a horizontal bar set well beyond a meter in height. They love swimming as well as retrieving. This is what makes them really happy. However active, energetic, and versatile Labs are they are also known to be especially prone to the development of a variety of health problems such as luxation of the patella, elbow and shoulder dysplasia (known as osteochondritis dissecans), and canine hip dysplasia. Occasionally, Labs can also suffer from exercise-induced collapse, muscular dystrophy, diabetes, tricuspid valve dysplasia, hot spots, cataract, hypothyroidism, and retinal dysplasia. To summarize, Labradors are highly active pooches that love many outdoor activities especially related to swimming and hunting. They are prone to the development of various health issues of the joints, the eyes, metabolism, muscles, and even the heart. The food that you’re going to get should reflect your understanding of these things about the Labrador retriever. The prevention of the various health issues that is quite common among dogs of this breed. In both goals of Labrador nutrition, the following nutrients are deemed necessary. It is quite easy to say that Labradors need proteins. On hindsight, as far as we know, there is no single organism on earth that will not require protein. It is the fundamental building block of all things. That being said, giving high protein dog food to Labradors is important especially in the development and maintenance of muscle tissues. Remember, while Labs are not heavily muscled like Boxers and other dog breeds, they do require strong and well-developed muscles. They need this so they can propel themselves in water or run after their prey during a hunt. The point is that muscles are what move the body of the Lab to accomplish many of its amazing feats. Proteins are also necessary for the formation of hormones and other cells and substances essential to the existence of the Labrador. For instance, the coat and skin of Labs are made of structural proteins without which there can be a loss of physiologic integrity, leading to massive infections. Likewise, certain cells of the immune system called immunoglobulins are dependent on proteins for their synthesis. Without proteins your Lab will not be able to synthesize antibodies and other immune system defensive cells to ward off infections. All cells and tissues in your Lab’s body require proteins. There’s a catch, however. Since proteins are supplied by both animals and plants it is imperative that the protein be sourced from animals as these come with complete essential amino acids. Plant-based proteins also contain amino acids; however, some of the essential ones are missing or are present in negligible amounts. If you really want to optimize the growth potential of your Lab, then by all means you need to choose a dog food whose principal source of protein is an animal. We now know that Labs are at an increased risk for the development of joint problems such as hip dysplasia, osteochondritis dissecans, and luxation of the patella. With this knowledge, it is important to provide them with foods that are enriched with either chondroitin sulfate or glucosamine or both. These substances are well known for promoting the increased production of chondrocytes or the cells that make up the cartilage found in the ends of adjoining bones. These cells are also responsible in part for the formation of synovial fluid, the lubricating fluid in the joint capsule. In many ways, chondroitin and glucosamine have been shown to strengthen the integrity of the joint capsule. Labradors are also prone to the development of eye problems such as cataracts and retinal dysplasia. It is for this reason that Labs need food items that are rich in DHA and taurine, two substances that are recognized for the optimal development of the Labrador puppy’s eyes. However, it is not only the eyes that are optimized the integrity of the central nervous system is also maintained. 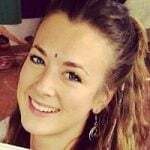 Equally important are alpha-tocopherols for their role in eye development. If glucosamine and chondroitin are needed for peak cartilage development, then calcium and phosphorus are essential for strengthening and keeping the structural integrity of bones. These minerals are important since they help make sure that your Lab’s physical activities are not hampered by fractures or problems in the integrity of the bone. We just would like to reiterate that probiotics are not nutrients. Rather, these are microorganisms that normally reside in the gastrointestinal tract to help offset the growth and proliferation of pathogenic bacteria. You can say they are the law enforcers in your Lab’s tummy. What many don’t know is that the gut is also the location of 70 percent of your dog’s immune system cells. By maintaining the balance of bacterial colonies in your Lab’s gut, you are also improving its immune system functioning. What Kind of Diet is Best for a Labrador? After tackling the nutritional requirements of Labradors, the next logical question would be related to the best kind of diet for this breed of dog. It is already clear that Labradors will benefit a lot from a high protein diet since they are naturally active and energetic. However, in today’s pet parenting, a lot of folks are simply not letting their Labs get the kind of exercise that they need. Many are restricted to the inside of homes. They may be able to play in the backyard but that’s just about it. This predisposes Labs to obesity because of the rather sedentary lifestyle that they are now leading. In such cases, a high protein diet may not be ideal since there clearly is no need to build muscle tissues secondary to reduced physical activity. That being said, the amount of proteins being fed to Labs can be reduced. A greater concern will be the calories that Labs take. Again, if you are talking about a very active pooch that swims in the rivers or lakes at least twice a week and has ample time playing outdoors on a daily basis, then this Labrador retriever will definitely need high calorie diet. Sadly, as we already pointed out earlier, many Labs as well as other dogs today simply don’t get the kind of physical stimulation and exercise they need to really spend the energy supplied by the food they eat. As such, any calorie that has not been used, usually in the form of carbohydrates, is converted into fatty acids and glycogen. This can further aggravate the tendency of Labs to be obese. Regrettably, obesity is not the only concern. Since carbohydrates are not being utilized as energy sources, there is a commensurate increase in blood sugar levels, predisposing Labradors to the development of canine diabetes. Fats are molecules that pack highly concentrated forms of energy. Since there is a tendency for Labradors to become obese because of excess unused energy, their diet should contain low fat. We are not espousing completely eliminating fat from their diet since these molecules are also important in maintaining the integrity of cells especially the cells of the central nervous system. These are also needed in the production of certain hormones without which other health problems may arise. Giving a low fat diet to Labradors is, thus recommended. So, what’s the best diet for Labradors? Based on what we have been discussing so far, the best diet for your Labrador retriever is one that is high in proteins and low in calories and fats. However, we really have to emphasize that this is just a generalization and may not actually reflect what your Lab needs. Like we already said your Lab’s ideal diet depends on a variety of factors including its age, its health status, its developmental stage, and even its activity level. This is especially true for the latter since many of today’s Labrador retrievers are leading a less than physically active lifestyle. They don’t get to swim or hunt like their ancestors did. That’s why they’re now more prone to obesity. Giving them high calorie, high fat diet may only increase the risk of obesity. However, it is also possible that your pooch is the archetypal Labrador – active, energetic, full of vigor. If such is the case, then you might need moderate calories and fats. The point we are trying to make is for you to consult your veterinarian about the specific dietary needs of your Labrador. Existing health conditions typically require a change in the usual dietary patterns. The same is true with developmental changes such as pregnancy, lactation, puppyhood, and aging. Only your vet will be in a position to assess the actual state of health of your pooch. This way he can map out a more comprehensive, more realistic, and definitely more appropriate diet for your Labrador. How Often Should You Feed Your Labrador? Labrador retrievers need to be fed in varying frequencies depending on their developmental age. Typically, puppies less than a month old should be fed on their mother’s milk and nothing else. This is to make sure that all the essential nutrients including all-important antibodies are conferred onto the puppies. By the time they reach 4 weeks additional feeding in the form of milk replacers can be introduced to augment the milk feeding. They should be fed 4 times a day until they reach the age of about 12 weeks. By then, they can be fed 3 times a day. By age 6 months, your Labrador puppy can already be fed twice a day, once in the morning and another in the evening. This frequency of feeding is typically observed well into the Lab’s adulthood. As always, these are just general guidelines. Your veterinarian can help you determine the exact frequency of feeding your Labrador often depending on its current state of health. Many dog owners also take their cue from their pets themselves. There are also pet parents who feed their adult Labs only once a day. Experts don’t recommend such practice since it favors the development of bloating in the dog. The amount of dog food you have to give to your Lab actually depends on a number of things. Remember what we said about determining the correct combination of calories, proteins, fats, and carbohydrates for your pooch to help promote optimum development and prevent the occurrence or the development of breed-specific health conditions. That is why it is imperative to seek the advice of your veterinarian regarding the actual amount of dog food you have to give to your Lab based on a variety of factors. 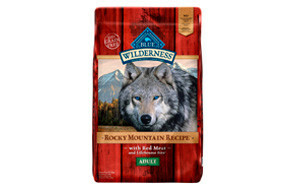 Additionally, you will have to take into consideration the type of dog food that you are going to give. If you give dry kibbles, these naturally have more nutrients packed in each unit of weight. 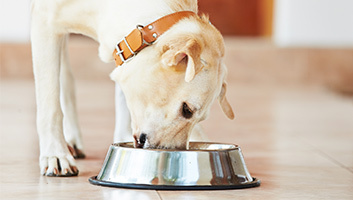 If you go for canned or wet dog food, this usually have less nutrient content since a greater proportion of it, about 70 to 80 percent, is water. So these should always be considered. Regardless, here are the current recommendations on the amount of dog food to give to Labradors. Understand that if your Lab is on a weight reduction diet, then these amounts of dog food will also be reduced. There’s plenty of reasons why Labrador retrievers are well-loved by many. Their gentle nature and multi-talented personalities make them very amiable creatures. That is why, if you own a Lab, don’t you think it also deserves the best nutrition for its happiness and optimum development? If so, then you can start with our list of the best dog food for Labs.